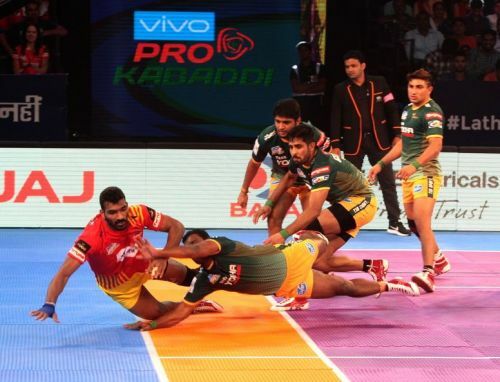 The Gujarat Fortunegiants had to eventually settle for a draw against the UP Yoddha in Friday's second Pro Kabaddi League encounter. Having suffered two consecutive defeats in their previous outings, Gujarat were desperate for a win in Haryana but they failed to keep their calm in the final seconds of the game. Coach Manpreet Singh decided to bring in Mahendra Rajput in place of Sunil Kumar for the final raid of the match. He believed the lanky raider could at least score a bonus point and help Gujarat win the game. However, it wasn't to be as Mahendra was tackled and to make matters worse, he completely forgot to attempt a bonus point, despite U.P allowing him ample space to do so. Post the match, Gujarat coach, Manpreet Singh provided a bizarre reason for Mahendra's unsuccessful raid. He believes Mahendra's brain stopped functioning due to lack of proteins in the body. "There was 40 seconds remaining and we were in the lead. I thought even if we concede a point, we would get the bonus. But Mahendra completely forgot about getting the bonus. I want to say that, this is the seventh venue, the weight limit in Pro Kabaddi is 85kgs." "Some of our players have reduced their weight a lot. When you reduce the weight suddenly, proteins start reducing in the body. That is why Mahendra could not understand that he had to get a bonus in the end. He shouldn't have made this mistake, he is an experienced player," the coach explained. However, Manpreet wasn't too bogged down by the result. The coach reckons this Gujarat side can beat any team in the league by a massive margin. It must be noted that Fortunegiants still sits pretty at the top of the table and needn't overreact at this stage of the tournament. "This Gujarat team can beat every single team in the league by a huge margin. We always take the lead but end up making mistakes. This wasn't the case before. Why is this happening? This is beyond understanding," he said. The coach though revealed that motivation has never been an issue in the team, suggesting that he team is practicing hard every single day. However he warned that Gujarat cannot afford to concede too many draws from now on. "We are working extremely hard. We lost two matches and then tied this one, going forward, we will make sure we dont tie such matches," he signed off.